It’s that time of year when people vow to make healthier life choices, get outside, quit a bad habit, eat healthier food, and tackle the world of better physical fitness. Though we charge forward into a new year ripe with ambition and focus, the best intentions can die on the vine without the right plan in place to keep us moving. 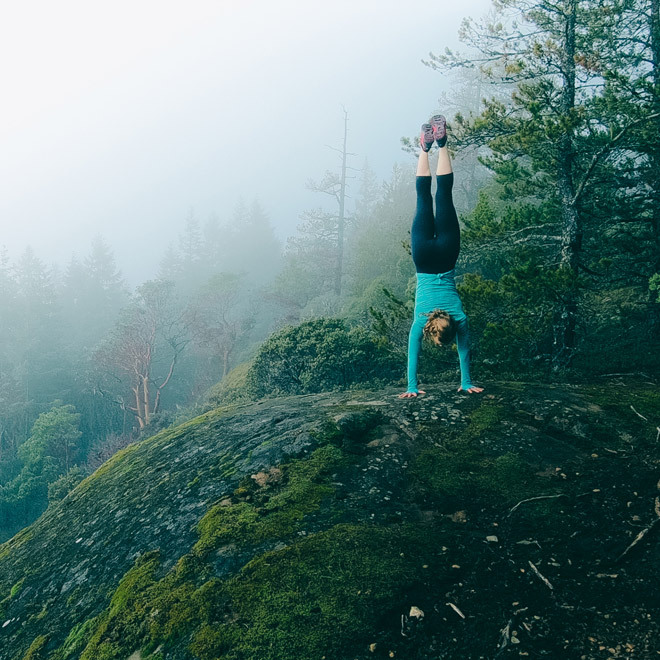 Fitness coach, endurance athlete, and all-around wilderness explorer Sarah Seads is based in the Comox Valley on Vancouver Island. Her business, Equilibrium Lifestyle Management (ELM) trains individuals and groups all over the world in fitness and competition, whether pounding the pavement towards that first 5 km or scaling mountains to achieve the ultra running dream. Although Seads now runs farther than some of us care to drive, she certainly didn’t lace up for her first major event out of the blue. Like the rest of us, she started small and still experiences the same issues as people just getting started on their fitness journeys: staying motivated, how to plan, and where to begin. Motivation begins, well, at the beginning. Seads’ journey has evolved into a lengthily resume of athletic successes because she chooses sport that combines her love for nature (inspired by her father’s commitment to family time in the wild), strengthening mind games, and feeling the body adapt and grow stronger. To begin each journey, it’s essential to create a vision. “Make a vision board, or write out a list of vision statements so that you have a very clear vision of what you want to accomplish and who you want to be,” says Seads. Finally, recruit support. “Hire a coach, download a plan, read, learn, and get the tools you need to make the best use of your time,” she says. Other tricks to keep you going over the long term include using the buddy system (being accountable to someone else can be huge), music, and signing up for an event (massive motivation can be found in preparing for an event). And every goal does matter. In fact, if you are meeting the minimum fitness guidelines – in Canada, these are currently 150 minutes of moderate to vigorous exercise per week; muscle and bone strengthening activities at least two days a week are also recommended – you are well on your way to health. “That number, 150, is a very powerful threshold for health,” says Seads. “Research now tells us that when we reach this number on a weekly basis, our risk of pretty much everything drops by 20-30 per cent. Heart disease, high blood pressure, diabetes, obesity—you name it. Seads says the most important advice she can give for anyone looking to start their health and fitness journey is: start today. She emphasizes how it all begins with small steps: Take one step today that will lead you in the direction of your health vision. Go for a walk. See how many push ups you can do. Then, tomorrow, do one more. Spend 10 minutes stretching during your favourite show tonight. Google your dream events and adventures, then make images into your screen savers. What are you waiting for? Today is your day. Sarah Seads and her team at ELM are there to help you reach your fitness dreams and goals, providing online and in person training, group coaching, motivation, education, and resources including training videos, articles, and training plans to support you on your fitness journey. Visit www.elmhealth.com for more ideas and inspiration. Take time to create a clear vision. Start today with a single step, no matter how small it may seem. Those steps will lead you to your vision. Communication: charged cellphone or an off-the-grid device such as the Garmin inReach Explorer.